1. Drain pears, reserving 1/2 cup liquid in large bowl; set pears aside. 2. Add honey, egg, lemon juice, lemon peel and vanilla to liquid in bowl. Beat until well blended. 3. Stir in baking mix, mixing until just combined. 4. Stir in butter or margarine; mix until combined. 5. Pour batter into greased and floured 9” or 8” square baking pan. Arrange pear slices evenly over batter in pan. 6. Bake at 350ºF for 30 – 35 minutes or until toothpick inserted in center comes out clean. Cool on wire rack. 7. 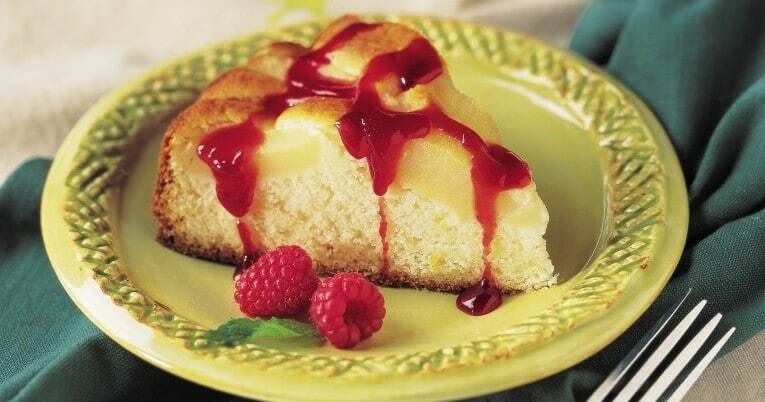 To Serve: Drizzle with warm raspberry jam. Garnish with fresh raspberries and mint leaves, if desired. Cut cake into 8 equal portions.